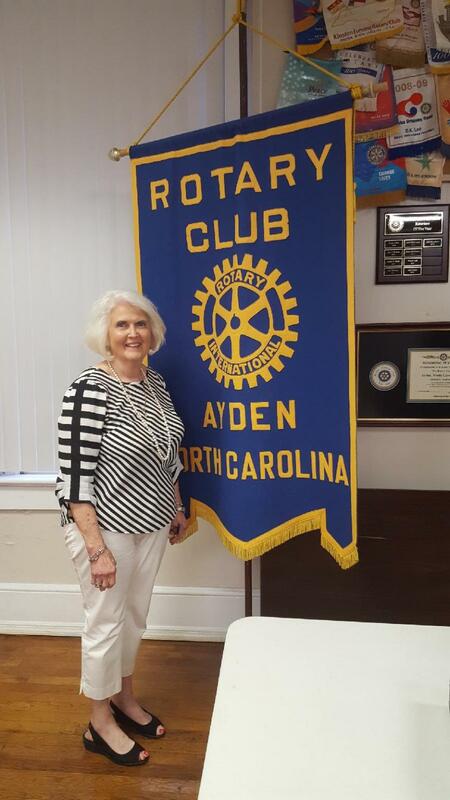 The Ayden Rotary Club is proud to present Barbara Wilson with a Paul Harris Fellow in Memory of Delano Wilson. This is the third Paul Harris Fellow presented to Barbara and Delano Wilson. It was 2009 when Delano Wilson was honored with his first Paul Harris Fellow Pin during his recognition ceremony with then District Governor Vivian Mott. 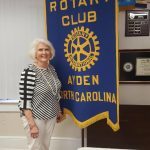 Mr. Wilson was a longtime member of the Ayden Rotary Club. He was also a member of the Ayden Masonic Lodge No. 498 A.F. and A.M., serving as secretary for 25 years. He served as president of the Ayden Rural Fire Association and as a member of the board of directors of the Ayden Boys & Girls Club. He was a certified master gardener and served on the Pitt County Agriculture Service Board of Directors. He had just completed a term on the Pitt County Board of Education in 2008. The Paul Harris Fellowship is named for Paul Harris, who founded Rotary with three business associates in Chicago in 1905. The Fellowship was established in his honor in 1957 to express appreciation for a contribution of $1,000 to the humanitarian and educational programs of The Rotary Foundation. Those programs include an array of projects that save an invigorated the Foundation programs provide educational opportunities, food, potable water, health care, immunizations and shelter for millions of persons.